Inspired by Pacific Crest Trail, the Oregon Timber Trail (OTT) winds 670 miles from the California border to the Columbia River Gorge. Its lucky riders will roll through pristine forests (without clear-cuts! ), old wagon roads, volcanic deposits, remote hot springs, high deserts and roaring rivers. What makes the OTT special isn’t just that bikes are allowed to ride on it (unlike the Pacific Crest Trail), but that it was created specifically for cycling. 90 percent of the route is unpaved and a whopping 55 percent — around 340 miles — is singletrack. What makes something “world-class”? Think of a trail that will garner international media coverage and entice people from all over the world to spend precious vacation time just to give it a try. In addition to the full route, many shorter segments and loops are being developed to appeal to a wide range of riders. Note: The route above is a draft and not the final alignment. To make it a reality, Travel Oregon enlisted the expertise of Chris Bernhardt in spring of 2015. Bernhardt is a renown trail planner who previously worked for the International Mountain Bicycling Association and Alta Planning and Design and is now a private consultant. As a starting point Dalgaard and Bernhardt looked at trail systems in the Swiss Alps and New Zealand, existing bikepacking destination trails across North America, and hut-to-hut systems like the San Juan Huts in Colorado. 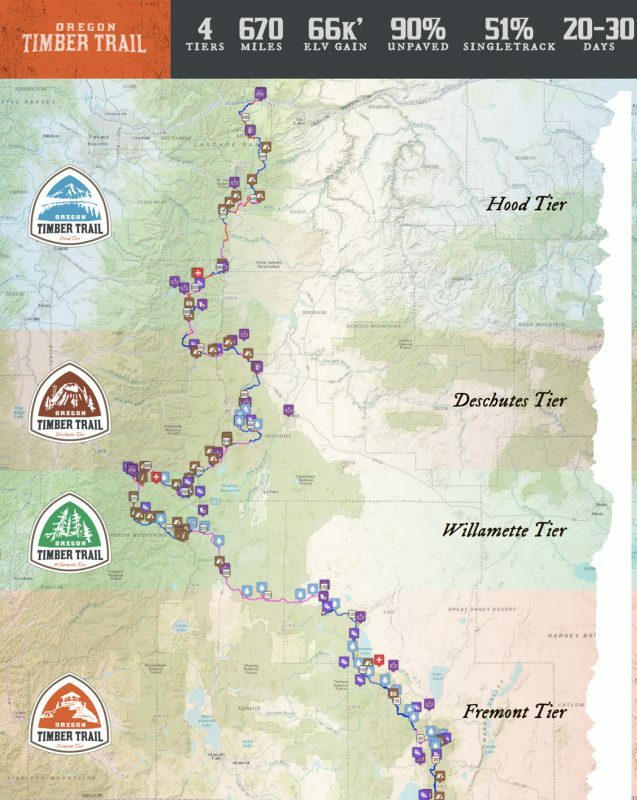 The goal was ambitious: Create a Pacific Crest Trail-like mountain biking experience that would display the splendor of Oregon’s natural wonders, boost Oregon’s $400 million annual bicycle tourism economy, and be accessible by a wide range of riders. As Bernhardt hammered out trail alignment details (and came up with the name, a nod to Oregon’s heritage), Dalgaard added another key player to the team: Gabriel Tiller. Tiller is the graphic artist and adventure journalist who founded Limberlost, an off-road exploration and touring company. Tiller helped shape the visual narrative of the trail and he served as first lieutenant with Dalgaard to make the project a reality. Tiller and Dalgaard say they both committed to “the long game” early in the planning process. Instead of simply plotting a route with an online mapping tool and then publicizing it through standard channels — they wanted to enshrine the trail at the highest levels of legitimacy. 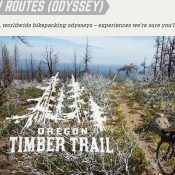 “It’s easy to release a route,” Tiller said, “But we don’t want this to be like the Oregon Outback and fizzle out after two years.” Tiller’s reference’s was to the unsanctioned off-road ride and route through central Oregon that got so popular its second year it attracted a bit of unfortunate controversy. Once Bernhardt analyzed the route and hammered out an alignment, Dalgaard took the concept to the United States Forest Service office in Portland. They encouraged him to run the idea by local trail user groups and land managers along the route. Since 95 percent of the route’s mileage is on USFS land, Dalgaard took the advice to heart. Harry Dalgaard in one of dozens of meetings with local user groups and land managers. Tiller and Dalgaard embarked on an 11-month outreach mission, traveling to towns large and small along the alignment in an effort to solicit feedback and — hopefully — support. They met with over 40 trail user groups, made 16 presentations and held eight, two-day planning charrettes. The alignment goes through existing trails, roads and other public right-of-way where bicycles are already legally permitted. Even so, clear benefits would come from the hard work of asking for endorsements from the USFS and Bureau of Land Management (BLM) staff in each of the four National Forests the trail passes through. In addition to institutional support, local land managers and trail users gave Dalgaard and Tiller valuable insights about the route itself. 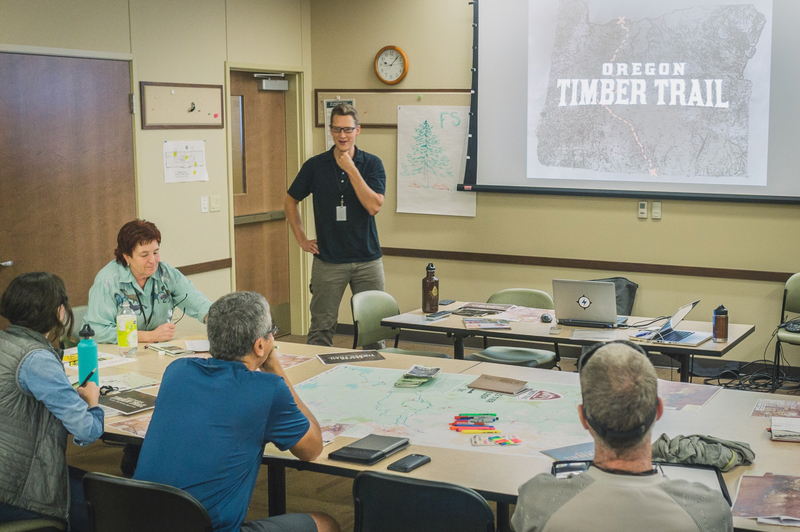 The outreach effort proved to be a key step for another important reason: it gave the Travel Oregon team a chance to educate people about bikepacking, a relatively new activity many current trail users and forest stakeholders might not have experience with. To many people, “mountain biking” conjures images of full-faced helmets and aggressive, high-speed riding — while bikepacking is more akin to hiking with wheels. The ability to explore Oregon’s history while on the trail is one of the key attractions of the route. At an explorers pace, you should be able to complete the entire route in just over two weeks (less than 40 miles a day). But Tiller and Dalgaard don’t expect everyone to attempt the full trail in one bite. They’ve split the route into four distinct “tiers” ranging from 130 to 200 miles — each one with a distinctive character based on its natural features. And for those who want a bit more luxury, trail backers want to refurbish existing USFS structures into overnight shelters and coordinate with existing private cabin and lodge owners in order to offer a true “hut-to-hut” option. The newly opened Suttle Lodge near Sisters, for instance, is already planning a bike wash station and repair shop. There are more plans for the future. That’s where new nonprofit Oregon Timber Trail Association will step in to complete the project’s next phases. Those include work on the overnight shelters, creation of a printed map and guidebook, new signage along the route, educational kiosks, trailheads, and building new segments of singletrack. 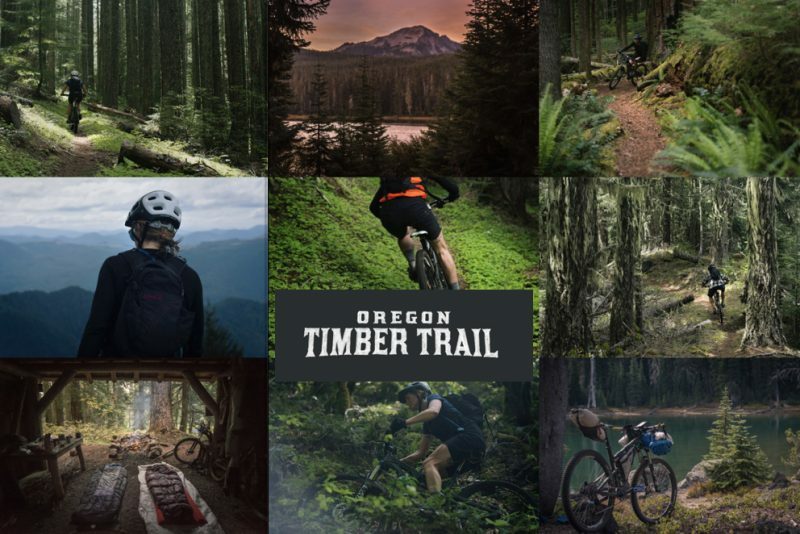 With the support from land managers and Travel Oregon, and the branding flair/street-cred Tiller brings to the project, the Oregon Timber Trail could become the most iconic cycling attraction in the state — or maybe even the entire continent. Time to start making plans for summer. This is incredibly exciting and kudos to Tiller, Dalgaard and others for taking such a thoughtful approach to build champions for the project across the state. Bummed I can’t make the launch party but please keep us apprised of any more updates. 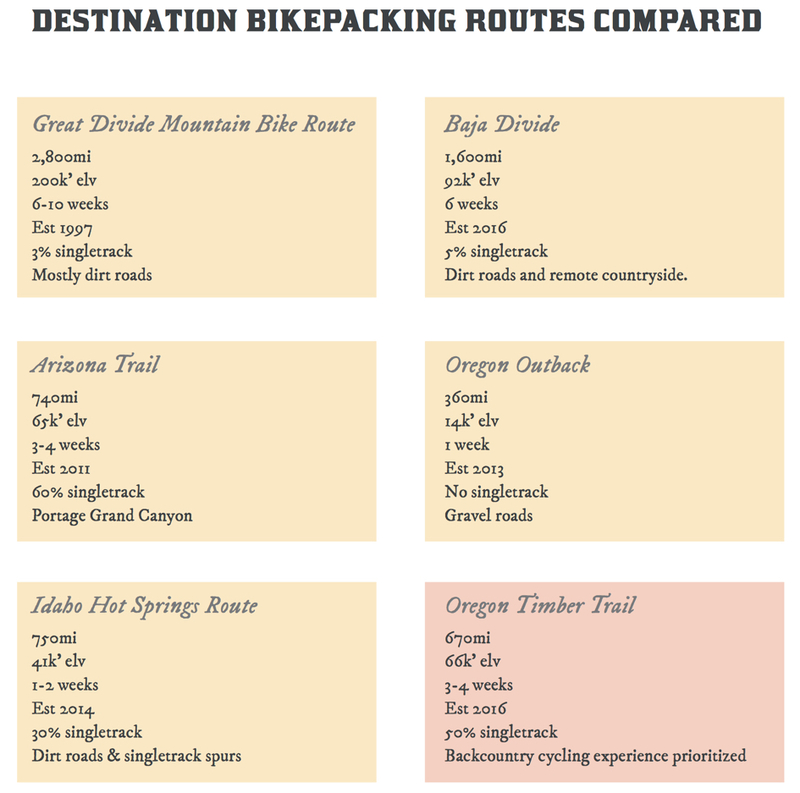 I’ve been wanting to try bikepacking and this sounds like an enticing introduction. Thanks Kate! The launch party will be fun, but the route will be released in detail online as well as other events through the spring and summer. Stay in touch by joining us at oregontimbertrail.org. Good idea, as long as the trail is routed outside of federally designated wilderness areas. I’m just now trying to look at information provided on the association’s website to see what’s been done in that regard. Sounds like the people involved in putting this trail together have done a lot of work already, checking with who it is that has authority over lands the trail is planned to be routed over. That’s an important step towards keeping the idea on a solid track to success. The hut-to-hut option could be very appealing to people that don’t take well to camping out. If the trail and support for people riding it, is put together well, it’s possible it could draw many people. I’m wondering whether timberland the trail is routed through, will be able to be kept from being logged somewhere down the line, because it seems one of the obligations of the Forest Service, has been productivity from the nation’s timberland, and that has meant some logging. Not to say that all logging is bad. Of course, if this trail were to come to be regarded as a 670 mile park, that could have some bearing on how logging along the route was managed. I don’t think you have anything to worry about there, Bob. Here’s why I am 110% sure this trail doesn’t touch any federal Wilderness Areas. 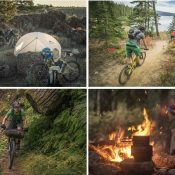 – I don’t know of a single mountain biking organization that advocates for illegally riding in designated Wilderness. I’m sure the OTTA isn’t doing so either. – This route is getting USFS endorsement. No way would that happen if the route traversed any designated Wilderness. – I have spent way too much time over the years poring over maps and pondering just such a route myself (in both Oregon and Washington). I know where most of the WA boundaries are, and at least from the level of detail I see on this map this route avoids them. Notice from that map that the route is pretty circuitous. Some of the back-and-forth (like the detour west to Oakridge) is to take in as much existing singletrack as possible, but much of it is to avoid designated Wilderness. Most of the big jogs you see are to go west of the Mt. Jefferson WA, around 3 sides of the Mt.Washington/Three Sisters WAs, south of the Waldo Lake WA, north of the Diamond Peak WA and north/east of the Mt. Thielsen WA. In multiple cases the route has to thread a fairly narrow needle between two existing WAs, particularly in order to cross the Cascades. It’ll be great to see this become a thing. Can’t wait to get out on some of the sections, and one day maybe the whole thing. Thank you to everyone involved in this project. Fantastic! This should provide some great riding. For those who are able, I do recommend walking on forest trails where bikes are not allowed. Lots of those here in the PNW. Both are great activities. There are some great frisbee golf courses in and around Portland, too. Walking is the minimalist mode of travel most consistent with the intrinsic nature of the forest. More so than travel with horses, atv’s, jeeps and other vehicles in the forest. Still, some people prefer to ride a bike, and since within Oregonm there is a lot of country, compared to some other more developed states in the nation…setting aside some of this country for riding bikes, sounds like a fair compromise to make. I’ve posted a comment earlier than this one, noting the importance of excluding from the bike route in planning, any wilderness areas, meaning ‘federally designated wilderness areas’, as compared to forest and other natural lands that have managed to retain a wilderness character despite whatever ranch, farming, mining, or logging activity they may have been subject to over the years. That comment was held in moderation, and continues to be, as I write. Not to say that wilderness lands in Oregon, not federally designated as such, shouldn’t be shown the regard due them. With this in mind, I think it’s important to consider what the impact of off-road biking on the adjoining landscape may eventually be, if the trail is successfully approved and developed, and in years to come, becomes popular with the result of possibly more people riding it than anyone ever expected. Effects of excessive use of the nation’s trails in park, forest lands and other natural lands, despite travel essentially being limited to walking only, is well known and documented. Proceed, and the do the best possible to protect land along the proposed route, allowing it to continue to have the beauty people will want it to have for generations to come. Indeed they are. Last summer I did a 35-mile, 3-day backpack trip from Rhododendron through the Salmon-Huckleberry wilderness and on up to Timberline Lodge. It was absolutely incredible, and I did it using the fantastic Mt. Hood Express bus service. Glad to be able to do both backpacking and bikepacking. This summer, if I get the chance, it will be bikepacking on part of this new route. I’m a backpacker too, I know the merits of both modes quite well! This is like a dream. Wow. Congrats to all involved, and thanks. I hope this new route will lead to better maintenance on the Fremont National Recreation Trail. I’ve hiked several portions of it (in Lake County) and ridden about 4 miles of it. Much of it is in too rough a condition for a rider to enjoyably navigate on a bicycle. In fact, I had plans to ride a particular portion (near Lakeview), but after scouting, found that it was in no shape for riding, and had to hike it instead. in various sections, I found downed trees (especially dead forests of beetle killed lodgepole pines), tread overgrown by grasses and sagebrush, and really narrow, rough grading. If you’re going to go, go prepared for hike a bike! Come join us the first weekend of June for our Fremont Tier work event! we’ll be trying to clear out the worst sections of blowdown on the FNRT. (and if you have specific sections in mind that need attention please email me at gabe@limberlost.co) We’ll be sending out more info about that event soon via our newsletter, sign up at oregontimbertrail.org. didn’t even know about this, thanks for all that you do, Jonathan! I’ve been so excited about this. I had the idea for a MTB-friendly route along the Cascades (as well as several other Pacific NW long distance routes*) for several years, especially after learning that in addition to the PCT for hikers there was a pavement-only bike route, but nothing on dirt for bikepacking. Great to see I’m not the only one with this idea, and that a group of dedicated people has seen it through to fruition. As the story says, there’s a big difference between drawing a line on a map and getting the Forest Service to draw it on their maps. I think the big surprise to me was how much singletrack they were able to include. About twice as much as I would have guessed possible based on my own knowledge: I knew about some of the longer-distance singletracks (Surveyors, Gunsight, Santiam Wagon, Bunchgrass, Fremont) but this still amazes me. Again, very impressive work. I look forward to riding a few segments, hopefully some this summer. * The route I’ve turned over in my head too many times to count continues up through Washington state, too: up over White Pass, then along the east sides of the Cascades through Cle Elum, Leavenworth, the Entiat and Chelan Mountains, and on up past Winthrop to the Canadian border. There is some seriously spectacular terrain on this route, possibly more so (at least in terms of big jagged peaks) than the Oregon portion of this Timber Trail. My other ideas include west-to-east cross-state trails in both Oregon and Washington, both of which could also offer connections to the extensive long-distance trail system coming together in Idaho. I also envision a a really remote Desert Bike Trail that continues east from the end of the OTT, arcing across a whole bunch of amazing ranges and basins to end near Hells Canyon. Thanks everyone, it’s been an incredibly rewarding process thus far and we’re excited to introduce the route to everyone. We’ve got trail work events in the works for each of the four tiers, as well as educational events. The best way to stay updated is to join the OTTA (link in the footer of oregontimbertrail.org) or follow us on instagram and facebook. See you on the 23rd! – Amtrak Empire Builder stops daily at Bingen, across the river from Hood River. You may be able to get a ride across the Columbia on Hood River Taxi (or by thumbing it) to the start/end point in HR. Alternatively it’s only a few miles upriver along WA-14 (wide shoulder, not too busy east of White Salmon) to cross at the Dalles, and you could do the awesome Mosier route into Hood River or just head directly up into the mountains from The Dalles and connect to the route around Surveyors RIdge. Amtrak does NOT have baggage service at this stop, so you’ll need to figure out how to carry your stuff on. They have added bike racks to their long distance trains, but my understanding is they’re in the baggage car and you can’t access them at the no-baggage-service stops. So Amtrak might be very tricky with a MTB. – Greyhound has service to Hood River. 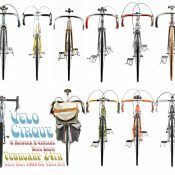 You’ll still have to figure out how to pack your bike into luggage, but somewhat oversized bags (as airlines would see them) should be possible. I have a 30x30x14″ soft bag (meant for a portable massage table) that I use to travel with a full-sized bike, after removing the fork, wheels, seatpost and pedals. I would expect most carriers to accept something like this, even if they don’t accept big bike boxes. – Gorgetranslink.com has a Tuesday and Thursday bus run between Portland and Hood River. Won’t work for weekend trips but would be great for a longer trip if you can fit into their schedule. Fare is $8 each way and the buses have bike racks! – Mt. Hood Express has 6-10x/daily service from Sandy to Government Camp and Timberline, both near the route. In summer they tow trailers full of bike racks behind the buses, so bike access is absolutely not a problem! You can get to Sandy from the east end of the Blue Line in Gresham using the Sandy Area Metro (ci.sandy.or.us). In total, from central Portland it takes around 5 dollars and 3 hours. – The Central Oregon Breeze bus stops at Government Camp (on the route), Redmond and Bend (a couple hours’ riding from the route). I believe it runs 1-2x/day depending on the season. No bike racks, so same packing situation as Greyhound. – Cherriots.org (Marion County) operates 3x/day buses from Salem as far east as Gates. I believe there’s a dirt-road possible along Opal Creek that allows you to get from there to Detroit/Breitenbush while mostly avoiding Hwy 20. Salem is a short trip from Portland on the bike-friendly Oregon Cascades trains, and the Cherriots buses have racks. – Valley Retriever (kokkola-bus.com) runs daily buses from Salem to Sisters (and Bend). Similar luggage situation as the other long distance buses, I believe. – Amtrak’s Coast Starlight runs between Portland and Chemult daily, but as with Bingen there is no baggage service at this station. – You can also get to Chemult from Bend on High Desert POINT (oregon-point.com). As mentioned above there are a couple different long-distance bus options to Bend, which also don’t have bike racks but should take oversized bags. – Coast Starlight also goes to Klamath Falls daily, with baggage service (meaning access to their bike racks, so this would be by far the easiest option for getting near the southern part of the route by transit. From Portland it’s about $40 and 7.5 hours. K Falls is not on the Timber Trail, but it is the western terminus of the OC&E Woods Line Trail, part of which is on the Timber Trail, so you could easily connect to the route from KF without having to ride on busy roads. Found one more. I forgot the route goes through Oakridge. – Diamond Express (see ltd.org) runs 3 buses a day from Eugene to Oakridge. Buses have bike racks. Also, if you’re taking the CO Breeze to Redmond or Bend you don’t need to bike the 25 miles from there to pick up the trail in Sisters. Cascades East Transit has buses 3x/day between from both Bend and Redmond to Sisters. Trip takes 30-40 minutes and costs $3.75. Another comment about connecting to Chemult: although the Central Oregon Breeze (cobreeze.com) requires you to bag or box your bike, they at least describe a process for it (including $5 fee) on their website, so they may be more bike-aware than some of the other carriers without bike racks. And once you get to Bend (or Redmond), High Desert POINT has bike racks and can take you the rest of the way to Chemult. This may be easier than dealing with Amtrak to get to Chemult with a bike, since Amtrak doesn’t offer baggage service there (unless they can be persuaded to). Stoked! So great to see these folks get this project done after so much hard work. Looking forward to tomorrow and to one day riding the trail! I love this idea, but without more detailed maps or route information there’s no way that anyone can attempt to ride even small portions of this route or do anything to get the less traveled portions ready to be ridden. I understand that much of may not ready for primetime, but that applies to most Oregon high country singletrack in the spring. Based on the late 2017 goal of mapping the route it’s hard to say it’s been established at all. When Idaho Hot Springs was “established” in 2014, this work was already completed and the route was ready to ride. Please release enough information so that all the faithful can get out and help get this rolling.